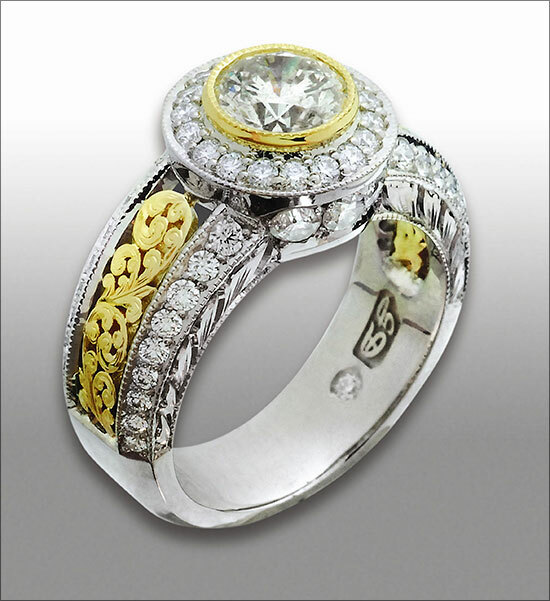 To create a new ring to showcase the beauty of a customer’s sentimental diamonds, Knoxville, Tennessee based jeweler Ron Litolff of Gemstone Designs blended old-world craftsmanship with 21st-century technology. Hand-engraved finish work augments the precise beauty of CAD design in this two-tone ring embellished with intricate scroll work. “Our client requested a remount for her major diamond,” Litolff says. “She was also excited about adding some smaller diamonds from her parents’ rings.” In Litolff’s design, the sentimental diamonds found a home in the side of the setting, accented by small bead- and bright-cut diamonds along the shank, as well as Gemstone Designs’ trademark placement of one stone on the inside of the shank. But it’s the scroll work that really makes this ring stand out. In Litolff’s initial Matrix CAD design, the ring’s shank was a single, solid piece. Using a splitting tool, Litolff “cut away” the rectangular section where the scrollwork would go. Essentially, the software lifted the surface of that area off the shank. Next, Litolff used the Create UV Curves tool to flatten out the surface (1). “This makes it very easy to draw the curves that will be used as the cutters,” he says. A combination of the Interpretive Curves and Bezier functions allowed Litolff to craft and fine-tune the scrolls. Next, the Apply UV Curves tool re-attached the section to the shank (2) — but it still appeared as a solid section, now boasting some scroll working detail. Litolff “lofted” the curves of the scrolls (3), giving them the proper depth. The Boolean difference tool, which translates set points on the curves as spots to cut away, created the negative space to give the detail its pierced appearance (4). All in all, Litolff says, creating this project, including the scrolls in CAD, took about six hours — and he notes that it’s something he probably would not have tried without this technology. Using the software’s Job Bags feature, Litolff showed his customer the fully detailed rendering, and then went back to a version of the model before things such as diamond channels and milgrain — features that he crafts by hand — were added in CAD. He sent that version to A3DM in Portland, Oregon, to create a rapid prototype model, which was grown in four parts: the main shank, the bezel for the center stone, and the two scroll work sections for the sides of the ring. The CAD rendering also doesn’t show the hand engraving that Litolff applies to the yellow gold scrolls. It’s perhaps the one place in this ring where the power of CAD actually wouldn’t make a difference. “While it is possible to create a fully engraved look in CAD, the time it would take would be too great,” he says. “I did cut a few lines in the scroll [on the rendering] to give some definition, but after the piece was assembled and polished, I added the shading to the scrolls. There is a lot of modern technology that went into this piece, but there’s also a great amount of good, old-fashioned workmanship with the diamond setting and hand engraving. In the rendering, the milgrain appears more like granulation — tiny spheres of metal. Here, the handcrafted milgrain has a more organically textured look. Litolff wasn’t sure at first where to best showcase his customer’s sentimental diamonds, as he didn’t want the scroll work to upstage them. The sides of the main setting make a perfect spot. This burnish-set ideal-cut diamond set into the inner surface of the shank is a Gemstone Designs’ trademark look. CAD/CAM facilitated the incorporation of 3-D scroll work into the design of the shank. The scroll work slips perfectly into the open space in the shank and is secured on the back side with a few well-placed shots from a laser welder.